When selling The Brooklyn Street House, we had zero furniture. And needed to stage on an itty bitty budget. ASAP. Luckily, my parents graciously let us have a chest and dresser set from my mom's childhood. It was also mine growing up. The set was showing it's age, but the construction was solid and we decided to spruce the pair up with paint and hardware. Refinishing furniture makes me nervous (the outcome is often a gamble), but I am thrilled with these! On Instagram, I have been going on and on about the pantry in the Myrtle House. Funny story about this room - once upon a time, it was going to be a powder room. Towards the end of the subcontractors' work, I came to my senses and realized that we didn't need 3.5 baths in a 1500 square foot house. So we changed the framing a bit and the door placement to create a walk-in pantry. The house was far enough along where the plumbing was already run to this area. Talk about a waste of a few hundred bucks! The pantry is not quite ready to show it's pretty face (still some touch up left) but I wanted to show you how cute this little sewing table makeover turned out. It is one of my favorite projects to date! Sewing tables with the built-in sewing machine are pretty cool. My mom had one so I learned how to sew on it as a kid. Basically there is a leaf on the top that extends to create a table top and then the sewing machine hidden in the belly of the table rotates and locks into an upright position. You control the speed of the sewing machine by a lever you push in with your leg. A really neat design and innovative engineering. That being said, I am embarassed to admit that we abused the heck out of the sewing table Brian's grandmother had at the Myrtle House. Since it was so heavy, we used it to support our table saw and tile saw. Once when we didn't have a locking front door, we used it to barricade ourselves in for the night (keeping it classy). After two and a half years of abuse and neglect, this table had seen better days but I knew I wanted to incorporate him into the house since it was such an integral part of the renovation. So after a little love, he is now the prominent piece in our new pantry and will serve as a coffee bar table! As we near the end of our renovation, the budget is getting tight. Who am I kidding, the budget was tight a year ago. We have been trying our best to recycle and repurpose anything and everything left in the house. When we installed our laminate counters, we cut out the sink hole and had a decent slab of laminate left. I threw it in a closet where it sat for weeks, but later discovered it was the perfect size to fit over the sewing table. We cut it down to size with a jigsaw, ironed on some white melamine edging, and boom - instant farble table. The best part to me is that this transformation literally cost nothing since I had all of the supplies (including the Sherwin Williams Mindful Gray cabinet paint) on hand. This chest... Such high hopes for this little Stanley piece, but alas, it ended up being one headache after another. Before I go into details (and warnings for other furniture refinishers), here is the before and after. It started off well. We cleaned, primed, and painted as normal. I loved how the paint color looked. It was the perfect shade of off-white. I sparyed the hardware an oil-rubbed bronze and then highlighted the features in gold dry-brushing. Still smooth sailing at this point. The last thing to do was a clear coat for protection and this guy was ready for a new home. I painted the clear coat with polyeurothane (mistake #1) at night (mistake #2). When I looked at it the next day, I found that my clear coat was streaky, had turned the color of melted butter, and looked terrible. Ugh. So we did some research and found out that ployeurothane is not the right finish to use on light paint colors; you should use polyacrylic. All of the other furniture projects I have attempted were darker colors, so this was never an issue. The only option is to sand down, re-prime, paint, and clear coat. Ain't nobody got time for that. So it will stay as is - an "aged/antiqued" finish. Lesson learned. *UPDATE: Some nice lady bought the piece to create dog beds out of the drawers. All is well in the world. For a while now, I have had my eye on this dresser. I love the design, the big gold pulls, and the soft pink color. However, the $2000 price tag is something I could do without. While browsing on Craigslist one night, I came across this dresser. It had good lines, ample storage space, and I knew I could re-create the above look for next to nothing. This little gem was a whopping $40. The existing hardware was okay, but the center pull was broken in half and I knew just the perfect hardware to create the high-end version I had in my head. D. Lawless Hardware was kind enough to send these amazing Solid Brass Ring Pulls for my project. They are just as pretty in person as they look online! If you are ever in the market for furniture or cabinet hardware, I cannot recommend this company enough. They have the best selection and the best prices around. I have ordered hardware for two kitchens and have been totally impressed with each order. 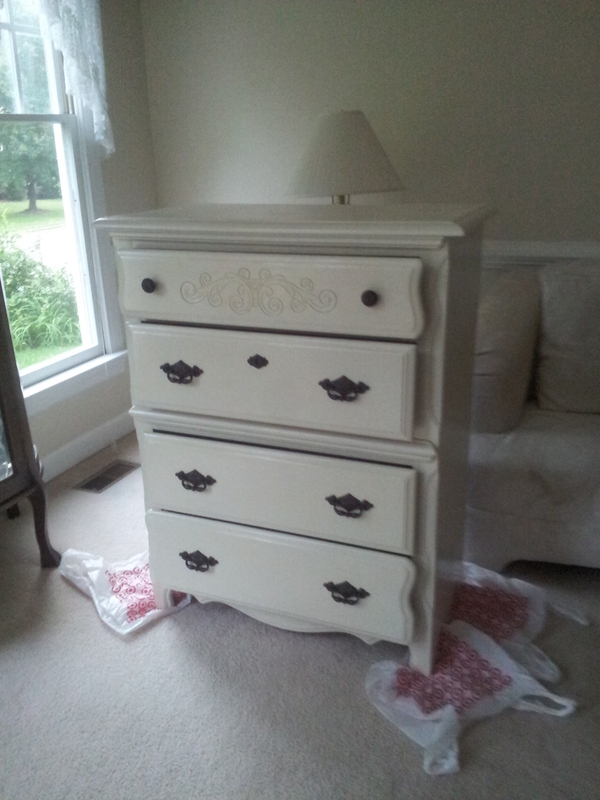 The piece of furniture is laminate, so it ended up taking two coats of primer as well as two coats of paint. I used Sherwin Williams Intimate White. It is a really pretty, soft peachy-pink and is actually the same color of our previous office/guest bedroom. 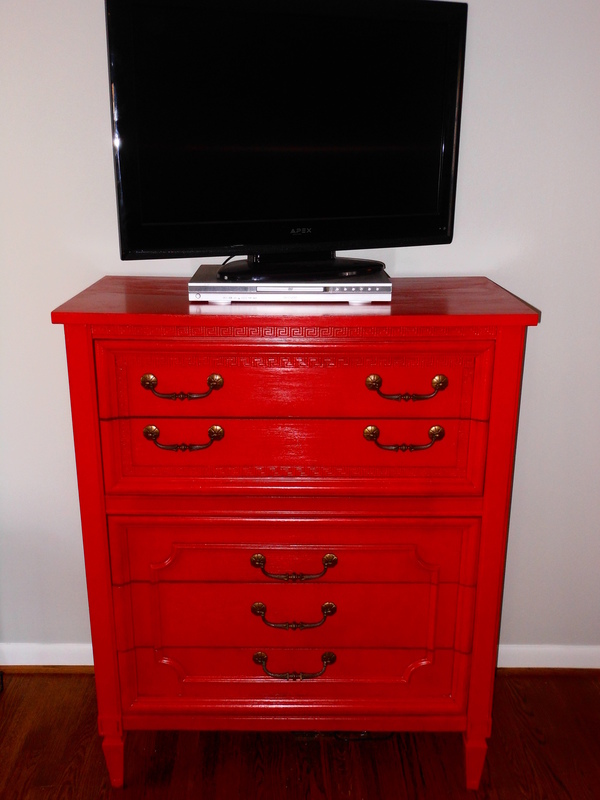 After multiple coats and quite a bit of soreness later, this little Craigslist dresser has a brand new look! And here is a little side-by-side before and after action. My poor little blog has been awfully boring these days. Spreadsheets, floor plans, and budgets do not feed the creative mind, so today I thought I would go back in the archives and show a fun before/after of a little vintage chest of drawers we refinished a few years ago while we are waiting for the fun parts on the Myrtle House. This cute chest was a $50 Craigslist find. A previous co-worker (also an Interior Design major) actually bought the matching dresser. That is Craigslist teamwork right there. It was pretty solid and only needed some paint. Loved that Greek Key detail. So here is the part where I went astray. You see, I was trying to prove to my neutral-loving self that I too can be bold. I can have brightly colored furniture in my house. I am capable. Well, I was wrong. Here is our first attempt. NC State red! If red is right, I think I want to be wrong. Fail. This is the part where I look at Brian and say, "Sorry, I know you love red, but this has got to go". With a sigh, we take it back outside for round two. This time around, I went with my gut and stuck to a more neutral palette of black and gold. Red is not easy to cover, my friends. The finish came out with this really neat antique finish with slightly crackled paint. Probably because we had painted the heck out of it. This little guy now has a new home thanks to Craigslist. So in your opinion, would have you kept the red? Or are you a neutral gal like me and prefer the black? So, since this week has seemed to be all about Craigslist, let's continue with this topic, shall we? :) The older (and hopefully wiser) I get, the more I refuse to shop at actual stores for home items. When we bought our first house, my motto was: no matter the cost, it has to be perfect. Well, this ultimately led to a lot of stress and strain on my wallet. Next go around, it will be different. I am going to try and buy almost everything second hand to 1. save money and 2. be a bit more friendly to the environment and local economy. Don't believe me when I say you can find awesome deals on Craigslist? Well let me prove you wrong! Here are a few finds on CL and their much more expensive, new counterparts. I adore this changer. The lines, the unique hardware, the PRICE. Your baby will be out of diapers soon (maybe not soon enough for your liking) and spending $2000+ for a changer that does not convert to a dresser does not compute in my head. Tack on an extra $50 for paint/supplies to this bargain piece and you have a brand-spanking-new pretty fancy changing table if you ask me. I love a classic Jenny Lind crib. Those spindles! This $20 crib is a steal and I don't even know if I would paint it. I kind of sort of love that off-white cream colored goodness going on. And, it is $20. Compared to it's $840 custom-made twin, it is the deal of the century. Armoires are great for a nursery since they provide so much storage and can hold your little guy/gal's clothes if you are short on closet space. The lines on this Craigslist armoire are gorgeous, and I think with a bright coat of paint and new hardware, this gem could shine again. You could even remove that wood detail at the top if you are going for a slightly less traditional look. So have I made you a believer yet? I hope so as I plan on continuing these kinds of posts. :) Plus, if you are in the Raleigh/Durham area, let me know if you are on the hunt for an item. I will keep an eye out for you in my searches! Also, if you have a house filled with refurbished treasures, please send me your photos/links!